Anyone who predicted that Carrie Underwood's second album would start with a sugary radio song might be surprised by the sultry, sassy, country-rocking "Flat On The Floor." But not to worry, pop fans — "All-American Girl" is a soaring, triumphant song that sounds like a hot hit, fresh off Music City's grill, and the moving and romantic "Wheel of the World" is chick-flick soundtrack friendly. 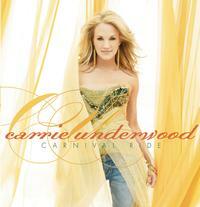 As a singer (and co-writer of three songs), Underwood really comes into her own on Carnival Ride, reminding country music fans why she was the first countrified American Idol and usurper of Faith Hill's throne.